What is U.S. “soft power” in a digital world? A key facet is the ability to form international friendships, person-to-person and organization-to-organization, in the 21st century. This enhances, in a very human way, “hard power,” the ability to affect militarily the fate of societies and nations around the globe. The role of objective news by U.S.-funded international broadcasters as contributors to soft power in a curious world. 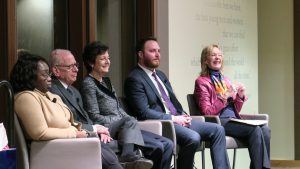 February 25: The American University’s School of International Studies welcomed a capacity crowd of 165 students and specialists to focus on that fine art in its many forms. A five-member panel shared views on how non-profit citizen organizations make a difference globally and in America, “handshake to handshake.” Watch the video of the panel. April 8: Another PDAA luncheon will examine the challenges international exchanges, official and non-governmental, face after U.S. embassies identify candidates for academic, cultural and leadership exchanges. (Left to right) Dr. Fanta Aw, Dr. Allan Goodman, Lynne Weil, Blake Souter, and Dr. Sherry Mueller. The non-profit Institution of International Education (IIE) and the Department of State actually have performed that task quite well lately. The number of international students visiting the U.S. last year was an all-time high in 2018, more than a million exchange visitors. 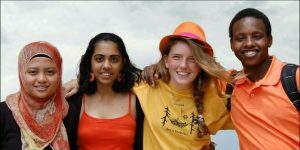 For the third year in a row, according to the 2018 Open Doors report on educational exchanges, the number of student exchanges topped the one million mark. A major force in this effort is Global Ties U.S., a non-profit organization that’s active in exchanges focusing on culture and arts, development, educational exchanges here and abroad, tourism and sports. It has local chapters throughout the U.S. These have organized exchanges here, in Argentina and a number of Western hemisphere countries, as well as Benin, France, the Ivory Coast, Hungary, Italy, Kosovo, Pakistan, Romania, Spain, Sudan, Zimbabwe and many more. President Donald J. Trump is greeted by Kim Jong Un, Chairman of the State Affairs Commission of the Democratic People’s Republic of Korea Wednesday, Feb. 27, 2019, at the Sofitel Legend Metropole hotel in Hanoi, for their second summit meeting. (Official White House Photo by Shealah Craighead). 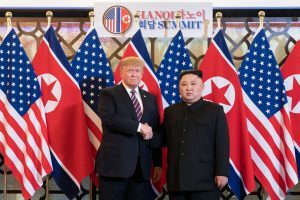 FEBRUARY 28 — Early reaction at a recent PDAA luncheon just hours after the unexpected ending of the Trump-Kim talks in Hanoi illustrated soft power as a means of sustaining contacts between Washington and Pyongyang. A highlight at the luncheon was a statement by Lynn Lee of the National Endowment for Human Rights, formerly from North Korea. She began by informing us that her mother, brother and sister remain in North Korea today. Sean Powers of the U.S. Agency for Global Media, parent organization of VOA and RFA, said the two international networks broadcast 13 hours a day to North Korea. Mr. Powers said that in a just-released survey of those who have fled the North, 84 percent said they listened frequently to one or both networks. Food shortages, the audience said, continue to be high and police powers are growing. MARCH 5 — The Assistant Secretary of State for Educational and Cultural Affairs, Marie Royce, spoke at the monthly George Washington University School of International Studies luncheon roundtable forum co-sponsored by the PDC, the PDAA, and the USC’s Annenberg School. Photo courtesy of U.S. Department of State. In addition to the moderator, again Dr. Mueller, and the IIE’s Dr. Goodman, others invited to participate are Mark Rebstock, vice president at the Meridian International Center here in D.C., and Ilir Zherka, executive director of the Alliance for International Exchange. 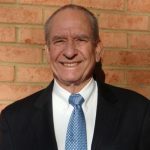 Mr. Zherka gained experience with exchanges working on Capitol Hill, on presidential campaigns, and as a political appointee. The United States National Security strategy of 2018 cites what it terms “two overarching strategic goals.” These apply to exchanges as well as international broadcasting. Those goals are: 1) expanding freedom of information and expression, and 2) Communicating America’s democratic experiences and values. The April 8 PDAA roundtable on exchanges will take place at DACOR-Bacon House, 1801 F Street NW. Registration for the luncheon on-line, no later than April 4, may be made at pdaa.publicdiplomacy.org. The cost is $35 for PDAA members and $45 for non-members.